Join us during one (or all!) 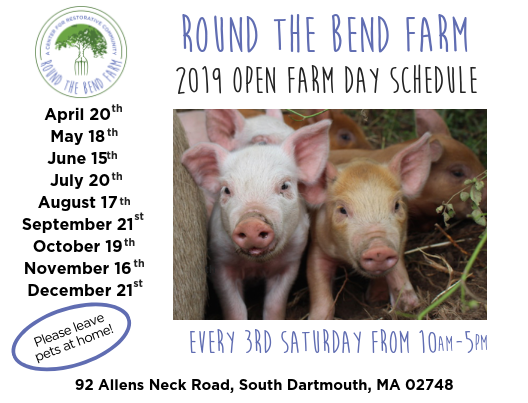 of our monthly Open Farm Days at RTB. These events are a great time to visit the farm, meet the team (and farm animals! ), purchase products from RTB and other local farmers, and be embraced by those that are striving to create a more restorative community for all. Workshops for both kids and adults! *T-shirts, sweatshirts, patches and more! We ask that you leave your pets at home, please. No Dogs! Open Farm Days are held at the new learning center. Need Directions? For more information, call 508.938.5127.